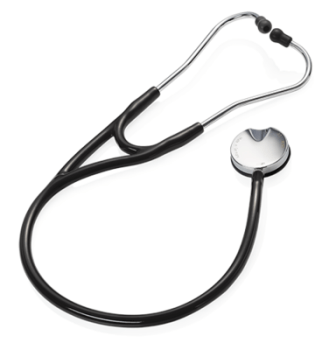 The seca s40 Stethoscope offers a heavy quality for a highly differentiated listening experience. The heaviness of the chest piece ensures accurate acoustics, particularly on patients lying down. The seca s40 lies so perfectly on the surface of the skin that background noise is reduced to a minimum. Using the resonance chamber lying in the dual membrane, not only can the sound be amplified but the frequency range can also be shifted. This makes the subtlest nuances in the high-frequency as well as low-frequency range more audible without needing to turn over the chest piece. The placing of the chest piece is particularly comfortable for sensitive patients due to the insulation ring. Chest piece: Its net weight ensures optimal skin contact and minimizes background noise.